Here is another little easter treat for you all! I had never even heard of bunny bait until a friend of mine brought it to our kid's daycare/preschool party last year. (This is the same friend who introduced me to the fabulous pizza dip- she has good taste!) I put a little on my plate to try it out, then I had to keep going up to the food table to get more. It is so addicting! I even brought a little home for my husband, who missed out on the party. He immediately wanted more! 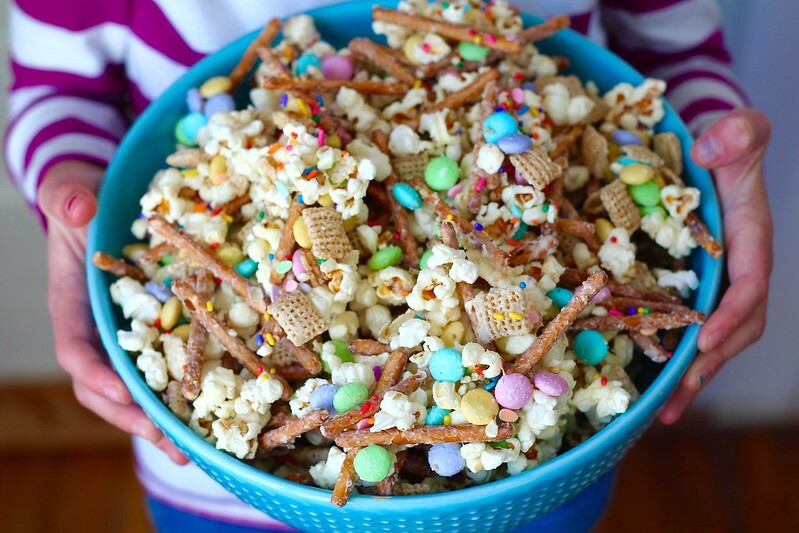 I have definitely made this for movie nights with the sibs and just to have as a treat in the house. It is amazing. Something about the sweet and salty mixture is unreal. Bunny bait seems to be a big hit on pinterest this year. So, I looked around at different recipes to get the idea of the basic recipe. This is a cinch! I prefer to pop my own popcorn, because that is always what we have on hand. But, you are more than welcome to use a butter-less microwave bag! This is an easy recipe to throw together for upcoming easter parties or for little treats for your kids! Regardless, it will be a crowd pleaser! Have ready a large baking sheet. Pop the popcorn kernels (or microwave bag) and place in a large bowl. 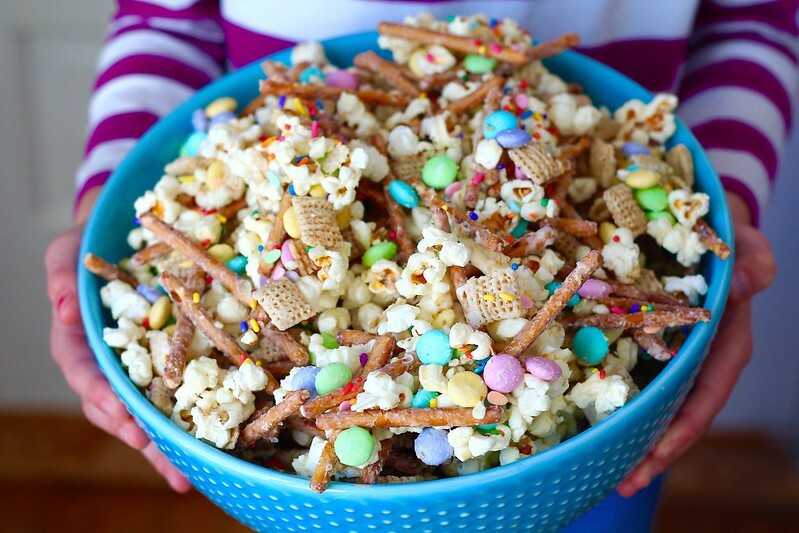 Mix in the chex and pretzel sticks. Melt the white chocolate in a medium bowl in the microwave, stirring until smooth. Pour the melted chocolate over the popcorn mixture and stir until evenly coated. Spread the mixture evenly over the baking sheet. While the melted chocolate is still soft, sprinkle the rainbow sprinkles over the mixture and the bag of m&m's. Let sit until the chocolate has hardened. Serve immediately, or store in an airtight bag at room temperature for 4-5 days.